The Battle of Kettle Creek was a major encounter in the back country of Georgia. It was fought in Wilkes County about eight miles from present-day Washington, Georgia. 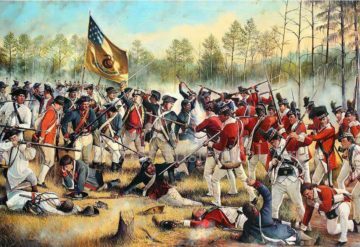 A militia force of Patriots decisively defeated and scattered a Loyalist militia force that was on its way to British-controlled Augusta. The victory demonstrated the inability of British forces to hold the interior of the state, or to protect even sizable numbers of Loyalist recruits outside their immediate protection. 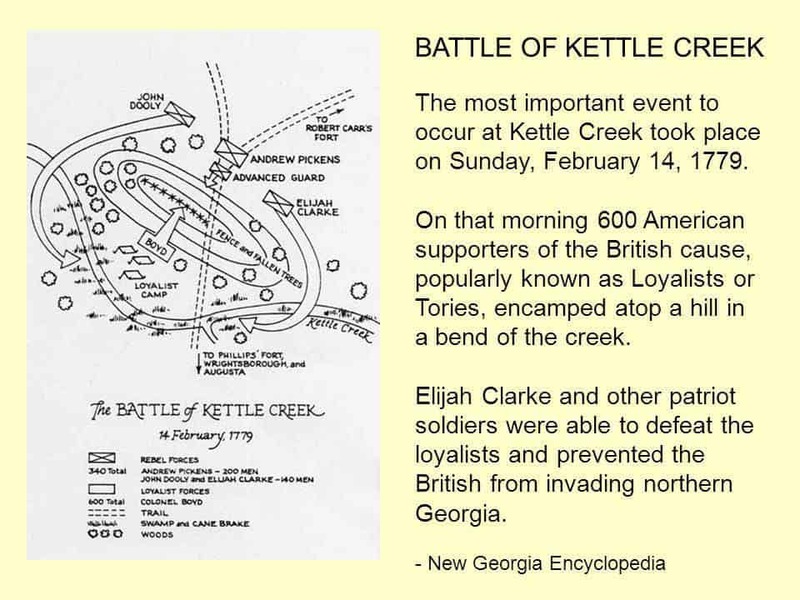 The British, who had already decided to abandon Augusta, recovered some prestige a few weeks later, surprising a Patriot force in the Battle of Brier Creek. 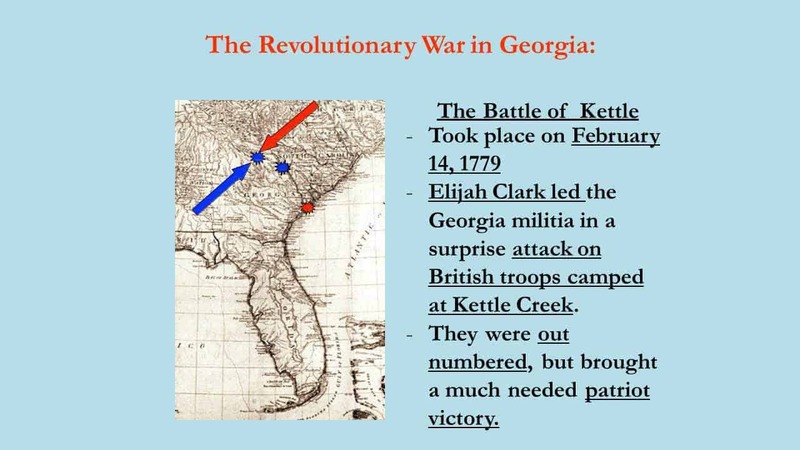 Georgia's back country would not come fully under British control until after the 1780 Siege of Charleston broke Patriot forces in the South. Armies - American Forces was commanded by Col. Andrew Pickens and consisted of about 340 Soldiers. British Forces was commanded by Col. James Boyd and consisted of about 700 Soldiers. Casualties - American casualties were estimated to be 7-9 killed and14-23 wounded/missing. British casualties was approximately 40-70 killed and 75 wounded/captured. Outcome - The result of the battle was an American victory. The battle was part of the Southern Theater 1775-82. 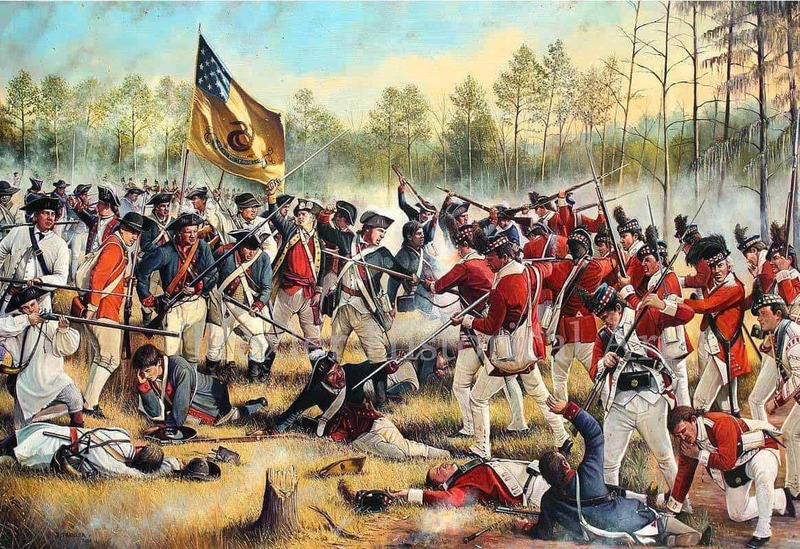 The British began their "southern strategy" by sending expeditions from New York City and Saint Augustine, East Florida to capture the port of Savannah, Georgia in late 1778. The New York expedition, under the command of Lieutenant Colonel Archibald Campbell, arrived first, landing at Tybee Island on December 3, 1778, and successfully captured Savannah on December 29, 1778. When British Brigadier General Augustine Prevost arrived from Saint Augustine in mid-January, he assumed command of the garrison there and sent a force under Campbell to take control of Augusta and raise Loyalist forces. 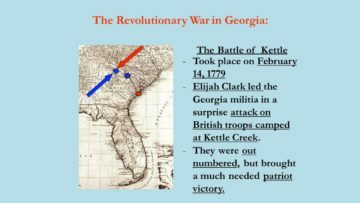 On January 24, Campbell and more than 1,000 men left Savannah and arrived near Augusta a week later, with only minimal harassment from Georgia Patriot militia on the way. Augusta had been defended by South Carolina General Andrew Williamson leading about 1,000 militia from Georgia and South Carolina, but he withdrew most of his men when Campbell approached. His rear guard briefly skirmished with Campbell's men before withdrawing across the Savannah River into South Carolina. Campbell started recruiting Loyalists. By February 10, about 1,100 men signed up, but relatively few actually formed militia companies, forming only 20 companies of the British Army. Campbell then began requiring oaths of loyalty, on pain of forfeiture of property; many took this oath insincerely, quickly letting Williamson know their true feelings. Early in his march, Campbell dispatched Major John Hamilton to recruit Loyalists in Wilkes County and Lieutenant Colonel John Boyd on an expedition to raise Loyalists in the backcountry of North and South Carolina. Boyd met with success and recruited several hundred men. As he traveled south back toward Augusta, more Loyalists joined his company until it numbered over 600 men in central South Carolina. As this column moved on, the men plundered and pillaged along the way, predictably drawing angered Patriots to take up arms. The Continental Army commander in the South, Major General Benjamin Lincoln, based in Charleston, South Carolina, had been unable to respond adequately to the capture of Savannah. With only limited resources (he was short of both men and funds), he was able to raise about 1,400 South Carolina militia, but did not have authorization to order them outside the state. On January 30, he was further reinforced at Charleston by the arrival of 1,100 North Carolina militia under General John Ashe. Then he immediately dispatched them to join Williamson on the South Carolina side of the Savannah River near Augusta. 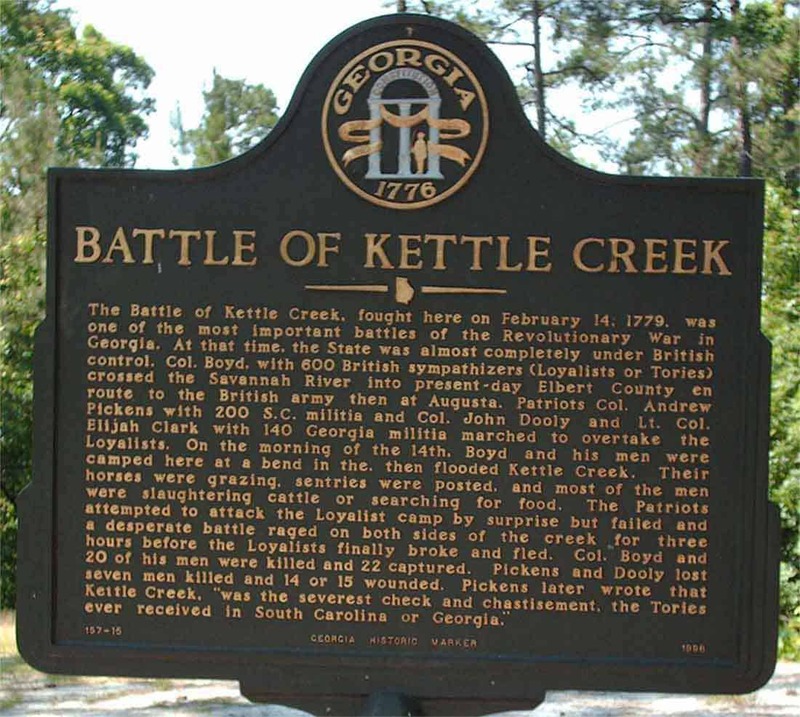 The Georgia banks of the Savannah in the Augusta area were controlled by a Loyalist force led by Colonel Daniel McGirth, while the South Carolina banks were controlled by a Georgia Patriot militia led by Colonel John Dooly. When about 250 South Carolina militia under Colonel Andrew Pickens arrived, Pickens and Dooly joined forces to conduct offensive operations into Georgia, with Pickens taking overall command. They were at some point joined by a few companies of North Carolina light horse militia. On February 10, Pickens and Dooly crossed the Savannah River to attack a British Army camp southeast of Augusta. Finding the camp unoccupied, they learned that the company was out on an extended patrol. Suspecting they would head for a stockaded frontier post called Carr's Fort, Pickens sent men directly there while the main body chased after the British. The British made it into the fort, but were forced to abandon their horses and baggage outside its walls. Pickens then besieged the fort until he learned that Boyd was passing through the Ninety Six district of South Carolina with seven to eight hundred Loyalists, headed for Georgia. He reluctantly raised the siege and moved to intercept Boyd. Pickens established a strong presence near the mouth of the Broad River, where he expected Boyd might try to cross. However, Boyd, his force grown by then to 800 men, chose to go to the north. He first tried Cherokee Ford, the southernmost fording of the Savannah River, where he was met with some resistance known as the Engagement at McGowen's Blockhouse. The encounter consisted of a detachment of eight Patriots commanded by Captain Robert Anderson with two small swivel guns in an entrenched position, who thwarted Boyd's approach to Cherokee Ford. 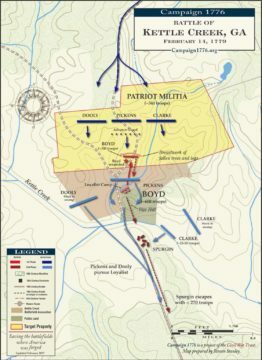 Boyd moved north upstream about 5 miles and crossed the Savannah River there, skirmishing with a small Patriot force that had shadowed his movements on the Georgia side. By the time Pickens learned that Boyd had crossed the river, he had himself crossed into South Carolina in an attempt to intercept Boyd. He immediately recrossed into Georgia upon learning of Boyd's whereabouts. 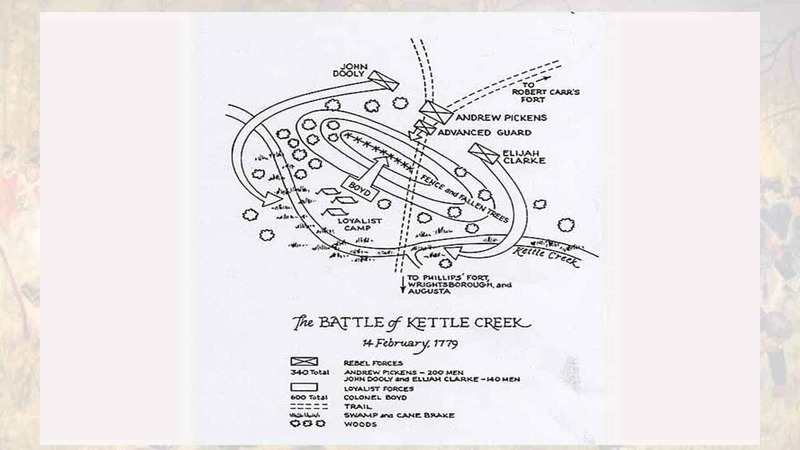 On February 14, Pickens caught up with Boyd when he paused to rest his troops near Kettle Creek, only a few miles from Colonel McGirth's Loyalist camp. Boyd was apparently unaware that he was being followed so closely, and his camp, even though guards were posted, was not particularly alert. Pickens advanced, leading the center, with his right flank under Dooly and his left under Georgia Lt. Col.Elijah Clarke. Gunfire between Patriot scouts and the camp guards alerted Boyd to the situation. Boyd formed a defensive line near the camp's rear and advanced with a force of 100 men to oppose Pickens at a crude breastwork made of fencing and fallen trees. Pickens, whose advance gave him the advantage of high ground, was able to flank this position, even though his own wings were slowed by the swampy conditions near the creek. 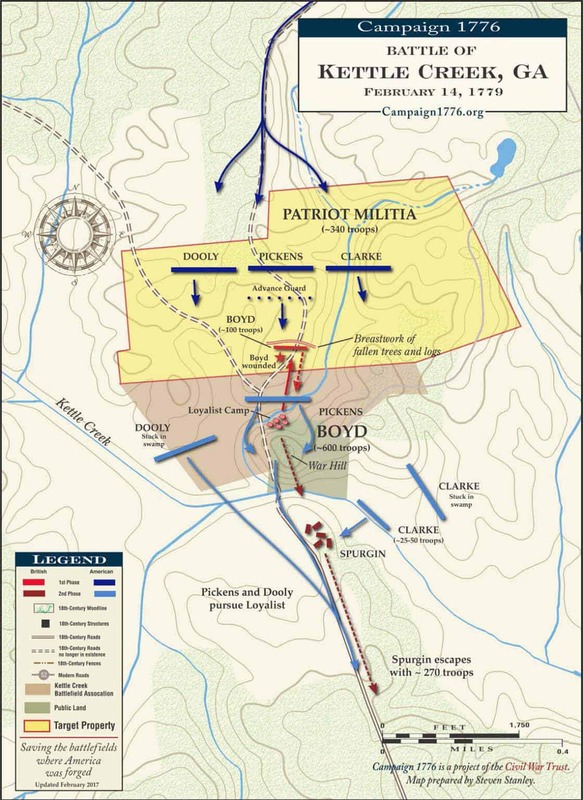 In heavy fighting, Boyd went down with a mortal wound, and the small company retreated back to the main Loyalist line. The Patriot flanks then began to emerge from the swamps. The Loyalists, led by Boyd's second in command, Major William Spurgen, engaged the Patriots in battle for 90 minutes. Some of the Loyalists crossed the creek, abandoning horses and equipment. 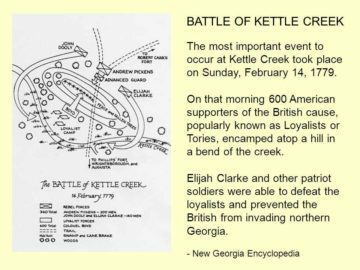 Clarke alertly noticed some high ground across the creek that they seemed to be heading for and led some of his men there, having his horse shot from under him in the process. The Loyalist line was eventually broken, and its men were killed, captured, or dispersed. Many of Boyd's men returned home. A significant number were either captured or surrendered themselves to Patriot authorities in the days following the battle, and the fate of some of his men is unknown.Campbell reported that 270 of Boyd's recruits eventually joined him. He organized them into the Royal North Carolina Regiment. When Pickens approached the mortally wounded Boyd after the battle, the Loyalist leader, who had lived in South Carolina before the war and was known to Pickens, asked the Patriot leader to deliver a brooch to his wife and inform her of his fate. This, Pickens eventually did. Of the Loyalist prisoners, only about 20 survived their wounds. Pickens first took them to Augusta, and then Ninety Six, where they were held along with a large number of other Loyalists. Seeking to make an example of them, South Carolina authorities put a number of these Loyalists on trial for treason. About 50 of them were convicted, and five men, including some of the men captured at Kettle Creek, were hanged. British military leaders were outraged over this treatment of what they considered prisoners of war, even before the trial was held. General Prevost threatened retaliation against Patriot prisoners he was holding, but did not act out of fear that other American-held British prisoners might be mistreated. His invasion of coastal South Carolina in April 1779, a counter-thrust against movements by General Lincoln to recover Georgia, prompted South Carolina officials to vacate most of the convictions. In a council held in Augusta on February 12, Campbell decided to abandon Augusta and began the withdrawal to Savannah on February 14 at 2:00 AM, the morning of the battle. Contrary to opinions expressed by some historians, Campbell did not leave because of the battle's outcome. He did not learn of the battle until after he had already left Augusta; his departure was prompted by the arrival of 1,200 of patriot General John Ashe's forces in Gen. Andrew Williamson's camp across the Savannah River, a shortage of provisions, and uncertainty over whether Boyd would be successful in his mission. 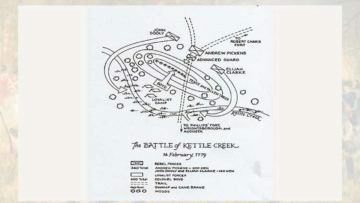 The success of Kettle Creek was undone to some extent by the subsequent British victory at the March 3 Battle of Brier Creek, which took place during Campbell's retreat. Augusta was latter recaptured by the British in June 1780 after Patriot forces collapsed in the aftermath of the Siege of Charleston. It was retaken by siege by Patriot forces on June 5, 1781.